Kuwait – 09 February 2019: Burgan Bank, announced today Mr. AHMED HUSSAIN HASSAN ALI as the lucky winner of the Al Thuraya Salary Account monthly draw. 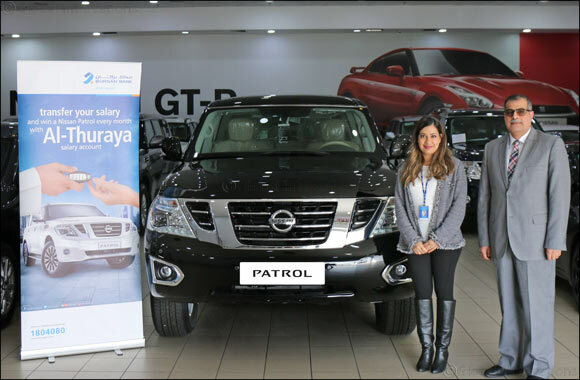 The draw rewards new and existing customers who transfer their salary to Burgan Bank by offering them a chance to win a Nissan Patrol SUV every month. With every KD 10 available in the account, the customer receives one chance to enter the draw. The Al Thuraya account holders have the option to hold money in Kuwaiti Dinar and other major currencies and can access account-related services such as standing orders, loans and credit cards, and benefit from the discounts and offers throughout the year. Customers wishing to open the Al Thuraya account can do so by simply visiting the nearest Burgan Bank branch and obtain all the necessary details, or simply call the bank’s call center on 1804080.